Is sprinkler system in place at the stair location? The RAL color has been converted into value for you to view on your screen. DO NOT SELECT A COLOR FROM YOUR SCREEN. The color/shades when viewed on a monitor may not be a true representaiton of the colors. For reference visit ralcolor.com or contact our customer service department for a copy of our color chart. Add any variations in flights here. 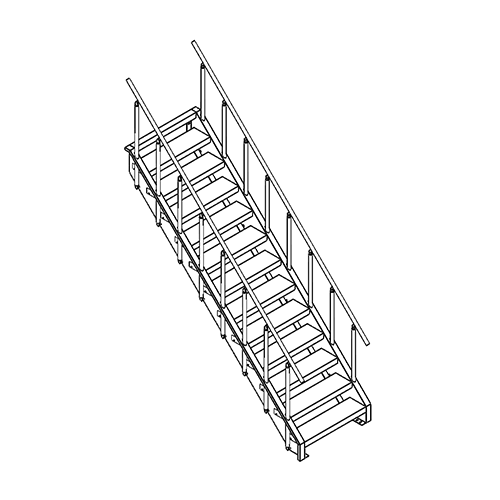 Provide a link to a plan/elevation view for applications that require platform(s) and support legs. Note: All quotes are preliminary until you have approved a Lapeyre Stair drawing.